Not on patrol with the police, today he's pampered with baths, conditioned hoofs and full-body grooming. "I've got the last memory," Larry Kanzler said as he looked proudly to his horse, Major, who was grazing in his pen. Cheryl Kanzler, his wife, said with almost 99 acres to roam in, three horse pals and weekly spa days, Major is content in retirement. "If he could talk, he'd say it's a good life," she said. "He'd probably tell you they don't work me enough, I'm getting a little out of shape, I'm getting a little overweight. But that'll come. We're going to take him camping." In 1979, When Larry Kanzler was a Portland Police sergeant, he restarted the mounted patrol unit, after it had been inactive for almost 25 years. 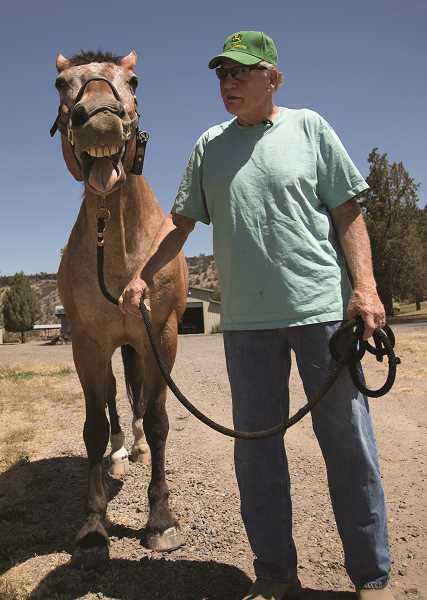 Now, but he and Major are retired but are still partners at the Kanzlers' place in Prineville. Larry Kanzler beamed at Major and said they have a book with hundreds of trails they want to explore. 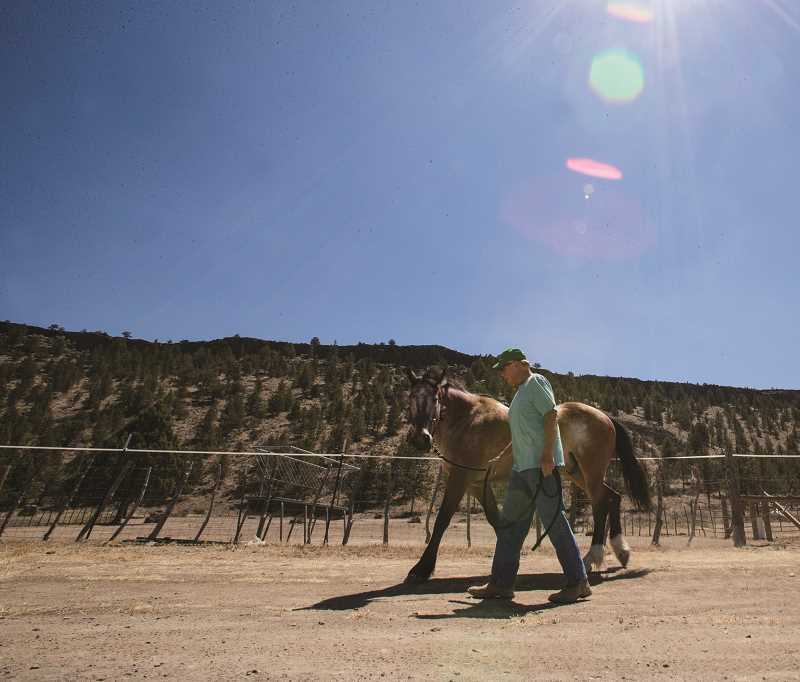 But until then, they're waking up at five every morning and fixing their property with hopes of hosting horsemanship clinics, in which professionals gather horses to train them. Cheryl Kanzler said, while Major has been less active, he's been more pampered with baths, conditioned hoofs and full-body grooming. "He loves it. He falls asleep every time!" she said. "It's so cute you can't help but love him." After spas, she said, he may even get to have a "pajama party," where he stays the night in his best friend Si's pen. "It's man love. Oh yeah, they love each other," she said. Major strode out from his enclosure and gave Larry Kanzler a big cheesy grin before stuffing his long face with some grass. "Call him a lot of things but never late for dinner," Larry Kanzler said. He said Major's most peculiar habit is always trying to get closer to people by nudging them with his head. "He's retired, he needs some love," Cheryl Kanzler said, "He's worked the mean streets." The boots Larry Kanzler wore when he used to ride his patrol horse, Toby, in 1979 still sit by his door like relics. "We both have had some sleepless nights about them getting rid of the unit," Cheryl Kanzler said. "For Larry particularly because it was always near and dear to his heart." She said she looks at the situation optimistically and believes the horses may still come back one day. Cheryl Kanzler also served in the Portland Police Bureau as a homicide detective. She said she remembers watching how effective the horses were when controlling crowds. "It was like the parting of the seas," she said. "I would love to see it come back." But if it does, she hopes they wouldn't take Major again. "He doesn't want to go back to the concrete jungle, he wants to stay out here in the sagebrush and have spa days!" she said laughing. Larry Kanzler said when he was in the unit, the horses "brought the police department back into the community." When officers sit in their cars, he said, there's a disconnect. "The city of Portland deserves to have a safe environment to live in and horses can be an integral part of that package," he said. "I don't think the people on the bureau have any idea what the capability of those horses are." Cheryl Kanzler said it isn't about the city having a budget for the unit, but about truly wanting it back. "If they really wanted to, they would find the money in a heartbeat." But in the end, Kanzler said her and her husband have the final trophy: Major.